In today’s review, I’m going to review a hand sent in by Alexander. This is a hand played on Poker Stars at $10NL. Hero is dealt KQo on the button, we raise, small blind decides to re-steal. Okay, totally standard so far. Hero decides to call. Again, totally standard. In this situation, it pretty much takes a crowbar to get to fold to KQ, especially against a re-steal. So in this situation, even more so with position, we definitely want to be giving action. Totally standard so far. And up going here, small blind checks, and hero decides to check behind. Let’s really start here. Unfortunately, Alexander gave me no extra information. We have no HUD stats, no reads, nothing to work with in this scenario. I’m just going to talk about it raw. In this scenario, I always like to ask myself a couple of different questions. Most of those questions are: What possible lines do we have available? What do I think the edge is for all of those lines? And then, of course, taking the most profitable line. In this scenario, we could check behind. But if we check behind, what are the turn and river run outs likely going to look like? What are we going to do if we pressure? What are we also going to do if the small blind continues checking? And I also weigh that against, okay, what if I just bet right this moment? In this scenario, if we decide to check the flop behind, and we get a bet from the small blind on most turn cards, since most turn cards are pretty brickish, if we face a bet on the turn, what’s our action? Well, for a lot of people, their plan here is to check behind because they just want to keep the pot small, so they induce a bet on the turn, they call, then on the river. They don’t really know a 100% what to do, especially if they start facing big bets. This is a very common thing that people tend to do. The alternative, of course, is to look at what about just betting the flop right this moment. Or, again, what else is going to happen when we check behind and our opponent checks on the turn, then we finally bet there? Did the check on the flop really do anything? You have to think about all the possible options that are at your disposal in this scenario. Look at both betting and checking. Try to estimate the EV of both lines. I think a lot of people will check behind here and try to use a showdown value mindset. They say, “Well, my bet doesn’t do anything, so I’m going to check here and I’m going to make decisions going forward.” And that’s fine. At least you’re thinking ahead. But I would say what about betting here? Because if you had air, or let’s just say you had JT, let’s say you had a gut shot, what would you do if villain checked you at this point? Well, you’d probably bet, right? You’d probably get things like eights to fold and you’d probably just apply pressure to everything else and that would be your overall goal. Unless there is history here where you need to strengthen up your checking range, or unless there’s a situation where you think you’re going to get check-raised a lot and you don’t have a solid plan against that check-raise, this is just a scenario where I would just fire. Honestly, I’m firing with a lot of hands here because I’m just trying to take advantage of the fact that the small blind is representing weakness, and I’m going to apply a lot of pressure to things like eights, nines, tens, jacks, all those kind of things. 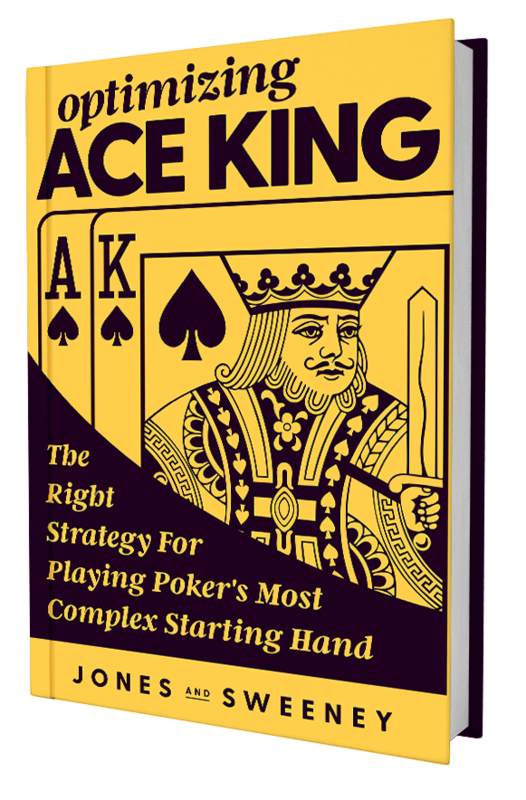 Get some powerful tips on creating a +EV plan for a poker hand. Well, probably going to check a lot of the time anyway, so you’re not really doing anything. You’re inducing bluffs occasionally. You’re also inducing tough spots when you face the turn and river barrel, and you likely don’t have a great plan on that, right? This may seem like a little bit of bibble-babble that’s just going all over the place, but, honestly, when you’re thinking about these spots, especially when you’re studying them off table, take the time to analyze the different lines, the different options that you have available to you, and really ask yourself what’s going to be the most profitable here, what’s the probability of certain best happening, what’s the probability of certain folds happening, and, ultimately, which line is going to offer the most DV for you? So analyzing the hand as it rolled out, again, flop went check, check. We end up facing a bet on the turn. Again, this is one of those common scenarios that’s going to happen when you do decide to check behind on the flop. It’s not shocking that we’re going to be facing a bet. We end up getting 3:1. Okay, obviously not folding at this point. Then on the river, we end up facing another half-pot bet and, again, not super, super uncommon. So as played, I’m certainly going to be calling this. I’m expecting to lose some percentage of the time. I’m expecting to win some percentage of the time. Obviously expecting to win often enough, especially getting 3:1. Again, we’re playing against an unknown, against an unknown I wouldn’t ever want to give so much respect as to say I’m behind enough here and I’m just going to be calling. I definitely don’t want to be over folding against any sort of unknown, especially when I have things as strong as KQ here. So because of that, definitely going to be calling. We end up winning the pot and that is what it is, but, again, was this play the best one possible? I don’t think it was. I think it worked out in this scenario, but there’s also going to be lots of times where we end up paying off against A5 or whatever it is, or backdoor hearts that got there, or KJ that got there for free because we decided to check behind on the flop. When I’m talking about betting the flop, again, going back there for a moment after our opponent checks, this isn’t really like some GTO conversation or overthought process of GTO that I’m trying to have. But one of the most important questions I like to ask myself here is what’s more important, thinning out my betting range or thickening up my checking range? Now, that might be a little overkill, a little advanced for $10NL, but it’s definitely a question that I’d like to start asking myself because it allows me to start thinking about hands the right way, rather than I’m just going to check here because I have second pair, and so I’m only going to bet really strong hands, I’m going to bet a ton of air, and I’m going to check all these marginal hands. Well, guess what? There’s lots of other people in your game that are doing the exact same thing and playing the exact same predictable way, not necessarily going to be the best thing. Now, sure, you may have bet here and you may have just folded out sevens. Okay. You’re still picking up $2.10 uncontested. Can’t really complain about that in the long run. Those kind of things add up. Sure, you have KQ this time, but next time you’ll have JT. So think about this as an overall thing, an overall exercise. Sure, in this exact scenario, we ended up calling down and ended up beating sevens. That’s all well and good. But, again, it doesn’t necessarily mean that the line was the absolute best. Again, focus on that flop conversation, really thinking about what those flop bets and flop checks are doing, which line is going to be best, and really thinking about all the lines at your disposal. You could bet the flop, probably pick it up a lot of the time. Sometimes when they call, they have a very predictable range. Or you could check, try to go some check, call, call, the kind of line like we did here. Sure, it worked out this time, but I don’t think it’s going to work out every single time, especially not in the long run. That’s going to wrap it up for this video. Alexander, thank you so much for sending this hand in. Hopefully this helps the next time you find yourself in a similar situation. If you’re looking for your next step today, I have a video in the Red Chip Poker Pro Membership called “When the Preflop Raiser Checks” that I would definitely suggest you check out. This kind of spot is very, very important, and while the average answer typically turns out to be, “You should just bet when the preflop raiser checks,” there are a lot of nuances that you definitely want to be aware of. In this video, I look not only heads-up pots, but also multi-way pots, definitely something you’re going to want to check out.